Different Special Traditions Included In Hindu Wedding Ceremony! The Hinduism is one of the most ancient religions in the world and all their religious and social events are celebrated according to the traditions mentioned in their religious scriptures. So a Hindu wedding ceremony is marked with number of special customs that the families of the new couple observe diligently. Most of these traditions were penned by the ancient sages in the Vedas, the earliest available Hindu religious scriptures. § Ganesh Pooja – The Hindus prefer to start all their auspicious events by worshipping Lord Ganesha, as per the instructions of their religious scriptures. So Ganesh Pooja is an important ceremony that is celebrated a few days before the wedding at the places of both the bride and the groom, for seeking blessing of Lord Ganesha to complete the entire wedding ceremony without any hitch. § Mehendi – Mehendi is a significant pre-wedding tradition that is held at the bride’s place and joined by all her female relatives and friends. Here, the bride’s hands and feet are adorned with lovely designs that are drawn with a paste of Mehendi or Henna leaves. So the date and time of Mehendi ceremony is usually mentioned in the Hindu wedding cards so that the guests can join the celebration on that day. § Var Yatra – The groom is supposed to arrive at the bride’s place or the designated wedding venue, with much pomp and grandeur. All the relatives and friends join this procession starting from the groom’s place, where they sing and dance merrily all the way. The groom mostly rides a white horse and he is warmly welcomed by the bride’s parents, by putting a Tilak on his forehead and throwing flowers or rice grains on him, as well as by doing an aarti with lighted lamp and other auspicious things on a plate. § Kanyadaan – The bride is led to the well decorated wedding spot by her father or brothers, where her father or any elderly male member of her family puts her right hand to the right hand of the groom, for offering her for life to her husband, which is religiously termed as Kanyadaan. In some places, both bride and groom hold their open palms together, over which the bride’s father places his hand and the bride’s mother washes their hands with water. § Saptapadi – This is the most vital part of a Hindu wedding, when the bride and the groom circle around a fire lit by the priest, holding the hands of each other. They take seven turns around this fire, taking a marriage vow with each turn for making their married life successful. The wedding guests need to be informed about the dates, time and venues of all the pre-wedding and post-wedding functions, along with the main wedding ceremony. 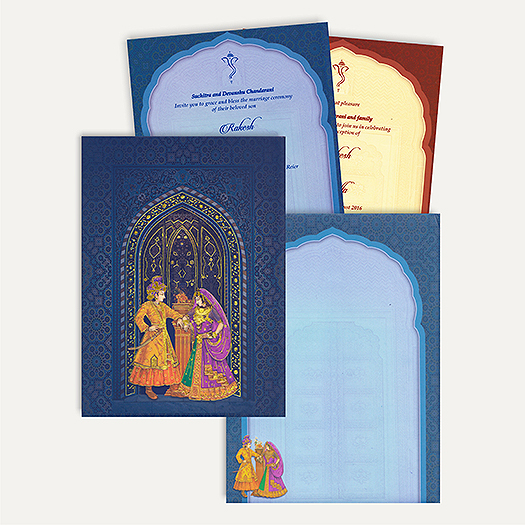 The Hindu wedding invitations are used for providing all these information to ensure the participation of the relatives and friends of the new couple. Moreover, the brief introductions of the bride and groom are also included in these wedding invitation letters. Thus, the wedding cards for Hindu couples are carefully created by the online card designers, for sending to the honoured wedding guests.